Oh, and to celebrate, I’m running a contest (of sorts). 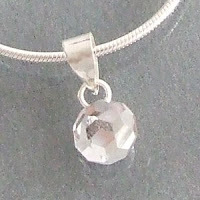 . . just leave me a comment and on 1 April I’ll draw a name to win a crystal ball necklace. This entry was posted on Monday, March 12th, 2007 at 4:51 pm in A Writer's Life, Blurbs and Promos. You can feed this entry. Responses are currently closed, but you can trackback from your own site.